ï»¿ ZC 2.53 Beta 10 8-way homing is bugged. Thread: ZC 2.53 Beta 10 8-way homing is bugged. 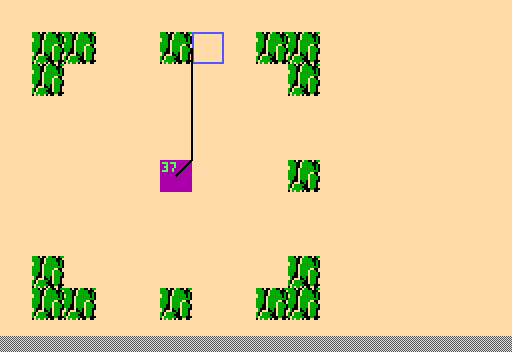 I created a keese type enemy with bat movement and 255 homing factor to test if the lined up function was bugged. Or if it was something else. Here's the result. 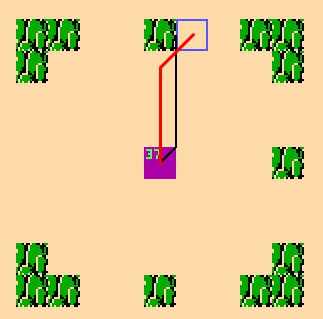 Link's position is the blue square. The black line is the path of the keese. Despite not being lined up diagonally it always follows that path. How would you want it to move instead? it shouldn't always move diagonally upright. as they are not currently lined up within 15 pixels of the 4 axis or the 4 imaginary diagonal axis. Good spot. Let me know when you check this. @Anarchy_Balsac Do your quests depend on the present, overly-sensitive, trap sensitivity, or weird enemy homing? I don't want this to turn into another issue, like the statues bugfix. @Tamamo I'll also backport whatever you push to 2.54, into 2.53 once it's tested. If you have issues building, to test the change, let me know. I don't use traps much, but when I do it's nothing a fix should hurt. The statues thing was only a problem b/c it can make statues do nothing. I kinda feel bad about that TBH. and few 8dir enemies are even giving homing factor. with the enemy editor they can all have it. But I think gleeok heads are the only ones with it IIRC. I still don't see the bug. You want it to home onto the center of link instead of the upper left corner of link? It's a bit hard to explain. It has to do with how the homing actually works. 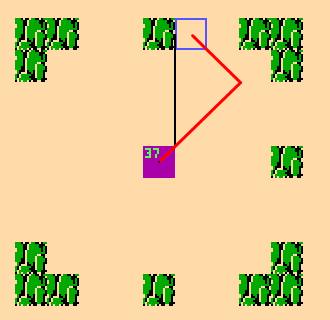 It's based off whether or not link is within range along either the x or y axis. for 8dir it should change direction only when lined up every 45 degrees. do to the way the lined_up function was written. Because it was always abs(lx-x)-abs(ly-y)<=range. but if link is farther on the y axis then the x axis but not lined up 8way (45 degrees again) then it doesn't matter because it results in a negative number. Similarily it will always result in a positive if link is far enough on the x axis and very close on the y axis to it's relative point. Last edited by Avataro; 03-20-2018 at 06:06 PM. This should be patched in all branches. Could use a re-test.